Filed under: New Products, PondKeeper. 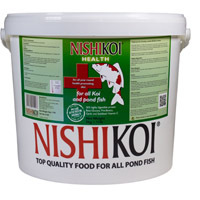 We’re really impressed by this new pond food from Nishikoi. 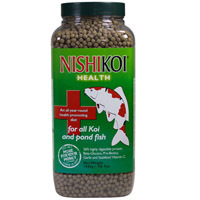 It has been designed to give our fish medicinal benefits as well as satisfying their appetite. As the food is whetgerm based it can be fed throughout the year when water is above 9 degrees centigrade. It is low inprotein and eaily digested. At the start of the pond season when your fish start to surface after a season of slumber you can be satisfied that you are treatintg them to a food that will equip them for the busy spring and beyond. After spending all winter laying dormant in your pond don’t you think your fish deserve a bit of a tonic? 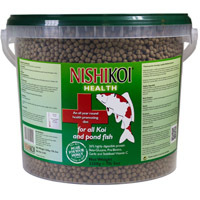 New for 2014 Nishikoi Health is a range of wheatgerm pond food that has been loaded with special ingredients to boost fish health. Being wheatgerm this food is low in protein and easily digestible so perfect to be given to your fish at the start of the season around March time (above 9 Deg C). The beneficial additives include probiotics, beta-glugans and garlic. Get the pond season off to a good start! As your fish come back to life after the long winter this wheatgerm food with addedfeatures will provide the perfect pick-me-up. Being wheatgerm based this food is easily digestible so suitable for feeding to your fish as soon as the temperature hits 9 degrees centigrade and above.